I like the DEWALT DW734 15 Amp 12-½ -Inch Benchtop Planer. Although I've seen better performance-wise when it comes to heavy-duty work, it does shine in all other categories and it's a keeper as a shop tool for sure. First impressions were impressive. The finish on the boards was professional-grade as far as I'm concerned, but this is to be expected with a planer capable of 30,000 RPM. My dust collector hooks up easily with its dust hood and few shavings were left on the ground soon after. In regards to its faults, it's more the fact that it's not a heavy-duty machine. It takes 15 to 20 passes on the hard maple, while a heavier duty machine can take it out in 5 passes. For site work around the shop, it's a good tool to have. Its finish on the boards is fabulous thanks to its 30,000 RPM. It's quite clean and dust collection is a breeze. It's not a production-tier heavy-duty tool. It falters in terms of dealing with hard wood like oak. What Benefits Should This Benchtop Planer Have? As a woodworker hobbyist, I'm always in need of a good planer for my woodshop. I do have heavy-duty planers lying around, but I reserve those for contract work and they tend to be overkill on anything that's not production-level work, like planer work on a replacement board for wood that's a bit softer than your usual oak and maple hardwoods. I'm always in need of planers with a silky smooth cut that doesn't leave any blade marks. You can only achieve this through planers with the right blend of horsepower, RPM, and amperage when all is said and done. I've also been burned before by machines that aren't easy to set up and have control that work clumsily or in a clunky manner, especially when it comes to doing hobbyist level woodworking. 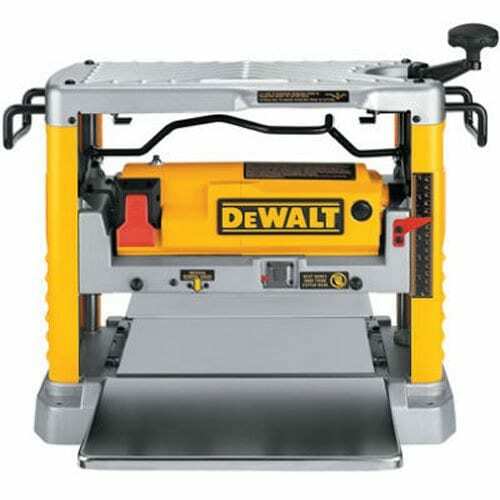 How I would've loved to have the DEWALT DW734 15 Amp 12-½-Inch Benchtop Planer by my side when doing those shop-type work so that my heavy-duty planers could be left alone to do their work so they won't be left shopworn from doing both home improvement and production-level type of jobs. That would've been sweet indeed and worth the investment. The DEWALT DW734 15 Amp 12-½-Inch Benchtop Planer is definitely made with woodworkers and construction workers like me in mind. I myself have done extensive work in the woodworking field, whether it's producing furniture or doing home repairs on any wood paneling within a given house. I had no need for industrial-level thickness planers because I already have several in my shop. What I need was an everyday ordinary thickness planer to trim my boards to a consistent thickness throughout their length and flat on both of their surfaces every time with a reduced number of errors and imperfections. I had high standards as a woodworker because I've seen what industrial planers are capable of. Woodworkers can benefit from the DEWALT DW734 Planer's snipe-free rollers, cutter head with 30,000 RPM cutting knives, and a draw board through a benchtop machine that has an adjustable table relative to the cutter head. This enables easy control of the thickness of the board, with professional results (as far as I can see in my humble opinion) by the end of it. In short, it's a must-buy for woodworkers across the board. This long-term investment of a planer enables you to buy rough stock and timber then end up with the smoothest boards that feel like they've come out of a production line. This is all because of the tool's powerful 15 amp motor that offers 10,000 RPM and 96 cuts per inch every time even against hardwoods. It's much more convenient to use the DEWALT DW734 because of its razor-sharp knives that you can dispose or reverse as needed. For something so disposable, they last 30% longer than traditional knives, so you can get the most of your planning before buying a fresh stock of sharp knives. A set of pins machined onto the cutter head goes through holes machined onto the knife, allowing straightforward replacements and knife changes on short notice. You can quickly find the knife and refasten the knife clamp with little to no instruction. It's all self-explanatory. As touched upon above, the debris management of the DEWALT DW734 is one of the best around thanks to its dust hood that allows for easy shop vacuum attachment. It also has a standing dust collector that enables efficient and immediate collection of debris and wood chips on top of the fine wood particles or sawdust. There's no doubt that a benchtop planer is a crucial tool for putting a professional finish to all your woodworking needs, especially in terms of boards and raw material. To better help you pick the right planer for your needs, keep in mind the following things. Your thickness planer should consist of a cutter head containing the cutting knives, an adjustable table that adjusts itself relative to the cutter head to control board thickness, a set of rollers that draw the board through the machine. There are two types of planer you can avail of. The DEWALT DW734 is a benchtop or portable type of planer renowned for its balance, smallness, and solid base. A stationary planer is required for more complex projects and is significantly larger in size (about as big as a table). The best planers you can find out in the market today involves first setting the table at a desired height before the machine is turned on. From there, the board is fed to the machine through its rollers. The in-feed roller grips the board, draws it to the head, and the board is smoothened out from there. A great planer should feature snipe protection. It should have means to correct feeding misalignment whether it's on the in-feed or out-feed tables. It should also accommodate for snipe by allowing you to keep the board overlong to allow for later trimming or adjustment. The DEWALT DW734 15 Amp 12-½-Inch Benchtop Planer is a shop woodworker's best friend with its 12½-inch cutting thickness delivered through its 20,000 RPM and 15-amp motor powering a three-knife cutter head that has a 10,000 RPM speed. Its main claims to fame include its extra-long feed tables, its accurate depth adjustment, and its quickness in smoothening out the rawest of boards in one or multiple passes depending on their condition, roughness, hardness, or presence of warps. Its motor is capable of handling deeper and larger hardwood cuts because of its 20,000 RPM and 15-amp motor. It's among the strongest motors in its class, and it takes industrial-class motors to outdo it. You're also treated to a high rate of 96 cuts per inch so that you can end up with a satisfactory result every time rather than something uneven that still requires extra work and sanding to get in polished shape. When you put the strength of the motor, the high RPM, and the sharpness of the cutter-head together, you'll end with one of the finest finishes in the industry. It's all about sharp blades running fast enough to cleave through the roughest patches. Instead of awkwardly sharpening blades until they break, it's instead more practical to replace your reversible and disposable blades with new and sharp ones every time to ensure streamlined work. You have a total of 33½ inches material support specifically because DEWALT DW734 has such a long table to accommodate your raw wooden boards and planks. Cleanup is a breeze when it comes to this device thanks to its universally compatible dust hood for shop vacuums. Snipe is reduced significantly thanks to the four-column carriage lock. The in-feed and out-feed tables allow for more sizes and bigness of wood to be planed. For disposable blades, the knives deliver 30% more knife life compared to their competitors. Dust management and shop vacuum compatibility with the dust wood ensures there's little to no cleanup afterwards. This device is an overall cost-effective deal for about $400 in light of its specs and capabilities. It takes 15-20 passes to cut through hard maple compared to other brands that could clean the board in 5 passes. It can blow the breaker every 10 to 15 minutes when dealing with the hardest of hardwoods or rawest of materials. Before making that purchase of the DEWALT DW734 15 Amp 12-½-Inch Benchtop Planer, I read everything about it. In retrospect, those reviews perfectly reflected my ultimate experience with the DW734 once I finally got it, so I'm glad I got the head's up from the start. They've also gone into detail in regards to cleanup efficiency, which is discussed several times in the summary and the pros and cons. You also won't end up wasting too much time with a sharpening block thanks to blade disposability and ease of blade installation that requires only minimal instruction. However, the reviews (both good and bad) also tend to complain about strains in the motor, difficulties with the breaker blowing every so often, and strains on the motor when the board has a bow or warp on it. You should be careful to not blow a fuse. In an afternoon, you should be able to go through 50 bf, but an industrial-grade planer is capable of 200 bf. Its limits are mostly focused on its struggles in milling the hardest of wood that are almost as dense as concrete, which even in and of itself is impressive for a benchtop planer of its size and weight. It's indeed perfect for site work out of the shop. Don't use it as a production tool since there are more powerful (and more expensive) planers for those jobs. What could be a better competitor for DEWALT DW734 than one of its own? The DEWALT DW735 is an improved version of the DEWALT DW734 in many ways, although it features the same 15 amp motor that goes 20,000 RPM and disposable knives that last 30% longer than other similar knives. It's available as a 13-inch thickness planer, with that extra half inch making a huge difference. To be more specific, it's capable of handling wider materials and doing larger cuts thanks to its extra half-inch width. What's more, it features a two-speed gear box so that you can change feed speed from 96 cuts per inch to 179 cuts per inch. This is in contrast to the DW734 and its one-speed gear of 96 CPI. There are a lot of things going for the WEN 6550, chief among them a comparable 15-amp motor capable of generating 18,800 cuts per minute (that compares favorably to the 10,000 RPM of the DEWALT DW734 cutter-head speed) and a granite table that offers a sturdy surface for the wood to travel through the feed. As for the feed rate, it's 26 feet per minute. As for the material support, this planer can take up to plane boards up to 12½ inches wide and 6 inches thick, which is below the material support of 33½ inches of the DEWALT DW734. As for the adjustable depth, you can go from 0 to of an inch with every single pass. The Delta Portable Thickness Planer also showcases a 15-amp motor like the rest of the planers on this list, but this time around, it offers excellent stability to ensure you accurate and smooth planning through its four column design (which it somewhat shares with the DEWALT planers). It also has the typical quick-change knife system and disposable knives, but this time its knives are dual edge and have easy-to-use alignment jigs to allow for streamlined adjustment. As for its in-feed and out-feed tables, they can be further adjusted for support of long pieces versus simply being large enough to hold bigger material. This is one of the best and most cost-effective planers around. Its main downside isn't that troubling either. You mainly have to set it up extensively and do a bit of clean up after taking it out of its box. Once you've removed the grease and plastic cling, it's ready to go. It's superior to the DEWALT DW734 in terms of its ability to flatten out cupped, warped, and bowed boards as long as you have a straight board to set the work piece in as well as shims to stabilize the board. The planer also requires bolting onto the table to keep it from moving around, which can reduce its portability features. The planer that the RIKON Power Tools Planer is most reminiscent of is probably the DEWALT DW735. They share many characteristics, namely the 15-amp motor capable of planing wood with an ⅛-inch depth and generous planing thickness of 6 inches and planing width of 13 inches. From there, the similarities end. The RIKON Power Tools 25-130H 13-Inch Planer has a unique helical head that cuts cleanly to ensure its smooth finish on softwoods or hardwoods. This is in contrast with the DEWALT DW734 and its difficult with certain hardwoods like oak and maple, requiring multiple passes to get them smoothened out. We all have good reasons for buying a planer as woodworkers. The great reason for taking the DEWALT DW734 is probably because of its smooth and precise operation and the breadth of potential boards it could handle. You can even make it do hardwood work pieces if you have the patience to deal with multiple passes as long as you only have a handful of them to plane. I also wanted something that's easy to clean up. This is because I've been burned before when it comes to planers that are messy and don't work perfectly with my 2 HP Cyclone Dust Collector. I got sick with all the sawdust and snipe from the in-feed and out-feed rolling tables. The DEWALT DW734 (check online for lowest price) works perfectly because it knows its audience and understands their needs.